Pignut - Conopodium majus - has just come into flower. I'm certainly going to try to sample one of the tubers this year. Yes, that's my finger in the lower left - sometimes the specimens need a little 'encouragement' to sit up nicely. I took some time to identify this ladybird. 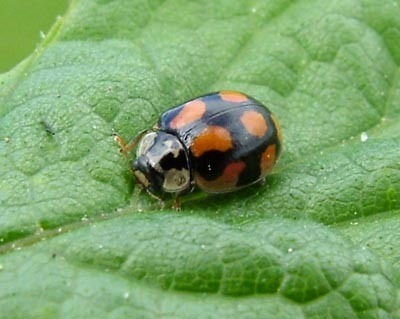 It's a melanistic (dark) form of the 10-spot Ladybird - Adalia 10-punctata. The black spots have enlarged to a position where they surround areas of red, giving the impression of red spots on a black background. Specimen about 4 mm long. 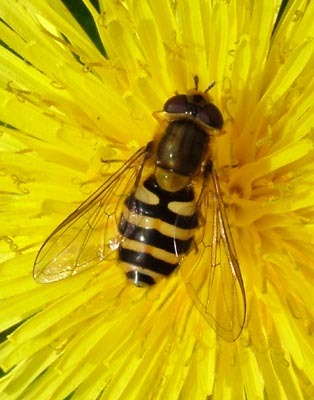 A few specimens of this hoverfly were feeding on the Dandelions. I really like these tiny (6 mm wingspan) Moth-flies. They run around like little jet aircraft taxying for take-off. This is a new seedhead of the Wood anemone. Seems like only yesterday that I saw the first buds.